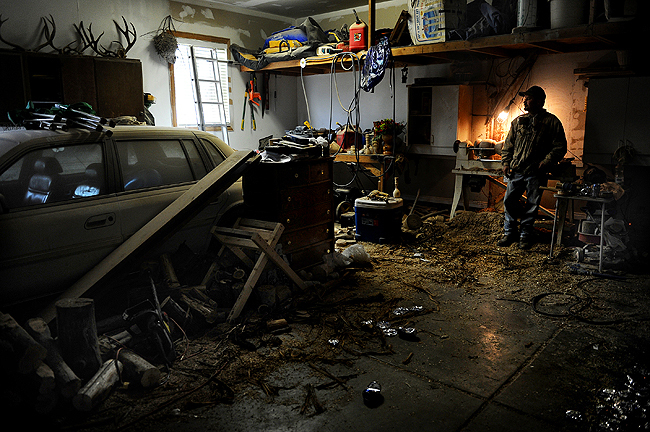 "Mike Hayward takes a break as he leans against his lathe at his Payson home garage, Monday, May 11, 2010. In his garage, he works about 12 hours a day to teach himself more about working with wood. He had never used a lathe before receiving it as a gift." In case you forgot, every month we photographers are given the opportunity to go out into the community and find a story on whatever we want - we call it the Monday Close Up. For the most part, we do a photo essay on our subject. But we also have to write an article, too. Some months the written story is better than the photos. Other times, the latter stands out more. And with me, sometimes my multimedia trumps them all. This month wasn't much better at first. I had nothing. I worked very hard to do one on a certain subject, but after days on days of calling and talking to countless people and contacts, it wasn't going to happen. So I opted to do a story on a man who was told to us by a message left on my editor's voice mail. I was going to shoot it as a standalone one day, but saved it. Eventually I made the call. I was going to do the story. And I wasn't too excited. To be honest, it sounded boring. But after meeting and hanging out with Mike Hayward for two days, I loved it. He wasn't afraid to be himself and say whatever or do whatever he pleased. We connected, shared stories and had a good time. He understood what I needed to do for work and he didn't hesitate to just do his own thing every day as if I wasn't there. Glad I got to meet Hayward and hope to bump into him again.